In children’s ministry, we are prone to talking about the “4/14 window.” The windows was names as such because it is between the ages of 4 and 14 that people are most open to spiritual input and form their spiritual views that last for the rest of their lives. As such, our work in children’s ministry between these ages is of critical importance. So when we speak about the mission field of children, we often speak about the 4/14 window. I believe the window is a fitting metaphor when it comes to missions. From a literal point of view, a window is a fixture that allows us to look from the inside out. As the Church, we must constantly be looking outward towards those not inside our walls and our communities. We must look through our windows to see those fields ripe with souls ready to be worked for Our Lord and Savior. And, not only is a window a means of looking outward, it is an opening through which we can reach out and touch the world. In a slightly more figurative sense, a window represents an opening. We talk about a “window of time” during which something might occur. In sports, we talk about a “window of opportunity” representing those years during which a team has accumulated the requisite talent to make a run at a title or championship. It’s no surprise then that mission opportunities are oftentimes referred to in terms of windows. Given the mission of our ministry, it will not surprise anyone to learn that this is the term I have coined for the mission field represented by children of divorce and their families. At Divorce Ministry 4 Kids, we define the term “children of divorce” to include children of single parents and children whose parents were cohabitating at the time of their birth who subsequently dissolved that relationship. Over the next few weeks, we will delve more into the need for missionaries in this largely untapped mission field, but today we will focus on the reason for naming this mission field the 6/50 window. The “50” part of our window is relatively easy to explain and relates to the percentage of children who experience the divorce of their parents. One commonly cited study indicates that 50% percent of children will witness the divorce of their parents. That study is a bit old and was published at the height of the divorce boom, so some additional clarification is helpful. More and more children these days are experiencing the loss of their intact family not through divorce but because their parents are cohabitating when they are born and subsequently split up. One study found that 34% of all births are to unmarried mothers with 18% being to cohabiting unmarried mothers. That means that about 53% of all births to unmarried mothers are to cohabiting mothers. A 2007 study shows that for children born to cohabiting parents, 49% experience the separation of their parents before age 3 (with 11% in the first six months and 22% within the first year). Another study reflects that, by age 12, 65% of children born to cohabiting parents experience the separation of their parents. The Second Annual Index of Family Belonging and Rejection found that 54.2% of children reach age 17 without both their biological parents married (since before or around the time of their birth). Accordingly, 50% seems like a pretty conservative estimate of the number of children who witness the dissolution of their parents’ relationships (without even considering the number of kids born to single mothers who never witnessed their parents together). While our mission window may actually be open even wider, it is at the very least represented by a 50% figure. The 6 in our 6/50 window requires a little bit more explanation and, as you will soon see, results from the amalgamation of various statistical findings. If something like 50% of all children witness and/or live with the dissolution of their parents’ relationship, that represents a significant number of children in need of the healing that ultimately comes through a personal relationship with Jesus Christ. In order to determine the other side of our mission window, we need some way of estimating what portion of that 50% eventually enter into a personal relationship with Christ. We start with the number of children of divorce who would define themselves as “evangelical” or “born again.” In Elizabeth Marquardt’s ground breaking study discussed in her book Between Two Worlds, she found that 41.3% of children of divorce refer to themselves as “evangelical” or “born again.” The portion asked whether or not they would identify themselves as “evangelical” or “born again” is a sub-set of the entire population of divorced children questioned (presumably those not identifying as Christian were not asked the question about being born again – roughly 70% of the total population of children of divorce responded that they identified themselves as Protestant, Catholic, Orthodox or “Other Christian”). As a percentage of the total population of children of divorce surveyed, 27.5% self-identified as born again or evangelical. For purposes of naming our mission window, however, we will stick with the 41.3% as reported by Ms. Marquardt. It should be noted that the number of children who self-identify as “born again” is actually higher among children of divorce than children from intact families which offers some encouragement for those of us who work with children of divorce. Marquardt surmises that those children of divorce who do self-identify as Christian may be more likely to identify themselves as evangelical or born-again because the evangelical church is, at least, willing to talk about the issue of divorce whereas many in our culture ignore the issue all together. They were certain that they would go to Heaven after they die only because they confessed their sins and accepted Christ as their savior. That means that, statistically, only 75% of people who refer to themselves as “born again” actually are based on Barna’s limited theological definition. So, if 41.3% of children of divorce self-identify as born again, only 30.95% (41.3% * 75%) would meet Barna’s criteria for actually being born again. Moral truth is absolute and unaffected by the circumstances. The Bible is accurate in all the principles it teaches. That Satan is a real force. It is impossible for someone to earn their way into Heaven through good behavior. Jesus Christ lived a sinless life while He was on earth. God is the all-powerful, all-knowing creator of the universe who still rules it today. Some might argue that not all six criteria are absolutely essential to being saved. I would disagree, but even given that argument, I would propose that, at the very least number 4 is absolutely essential and number 5 is critical. So of our 30.95% calculated above, only 5.88% hold a biblical world view. That means that roughly 6% of children of divorce are born again and hold to a biblical world view. 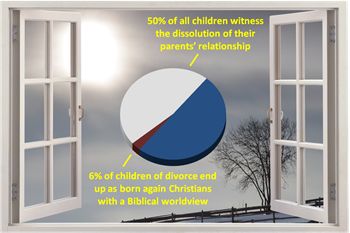 In short, our mission window is represented by the percentage of children of divorce who end up as born again Christians with a biblical world view (on the low end) to a conservative approximation of the number of children who witness the dissolution of their parents’ relationship on the high end. Within this 6/50 Window are a multitude of hurt and damaged souls ripe for the light and love of Jesus Christ. Faced with the 6/50 window as a mission field to which the church is called, we must as the Body of Christ answer a series of questions including: Why do we need to focus on this window? How is this mission field different than the mission field of children in general? What does it mean to focus on children of divorce as a mission field? How does living with the consequences of the dissolution of their parents’ relationship affect the spiritual journey of these kids? What can we as the church do to help? What does a missionary in the 6/50 Window look like? Over the next few weeks, we will answers these, and other questions, related to the 6/50 Mission Window. Note: I like numbers and statistics, and we cite them frequently here on DivorceMinistry4Kids.com. However, one of the frustrations in dealing with statistics is that many people will cite them without reference to the original source of the information. This leaves them unverifiable and helps to explain the general distrust for statistics among many people. Perhaps the old adage that “92.435% of all statistics are made up, including this one” is actually true. To that end, I have endeavored to include notes referencing all of the statistics cited in this article. In the end, the 6/50 Window is not about specificity or preciseness. It is about giving a name to a clear and present problem which the church needs to address. Bilotta, Larry. “18 Shocking Statistics About Children and Divorce.” Marriage Success Secrets, n.d. (http://www.marriage-success-secrets.com/statistics-about-children-and-divorce.html). citing Furstenberg, Frank F.; Peterson, James L.; Nord, Christine Winquist; and Zill, Nicholas “The Life Course of Children of Divorce: Marital Disruption and Parental Contact” American Sociological Review, 1983, Vol. 48 (October 656-668). Osborne, Cynthia, Wendy D. Manning, and Pamela J. Smock. Married and Cohabiting Parents’ Relationship Stability: A Focus on Race and Ethnicity, November 11, 2007. (http://www.utexas.edu/lbj/chasp/publications/downloads/married_cohabilty.pdf). Wilcox, W. Bradford. Why Marriage Matters, Third Edition. Institute for American Values & National Marriage Project, August 2001. (http://www.americanvalues.org/bookstore/pub.php?pub=81) citing Sheela Kennedy and Larry Bumpass, “Cohabitation and Trends in the Structure and Stability of Children’s Family Lives” (paper presented at Population Association of America Meeting, Washington, DC, 2011). Fagan, Patrick F., and Nicholas Zill. The Second Annual Index of Family Belonging and Rejection. Marriage & Religion Research Institute, November 17, 2011. (http://marri.us/get.cfm?i=RS11K01). Marquardt, Elizabeth, Between Two Worlds: The Inner Lives of Children of Divorce, Crown Publishers, 2005.